The historic and successful visit of the Chinese Vice- Premier of the State Council Zhang Gaoli to Khartoum, marked and emphasized the deep ties of friendship and cooperation between the two friendly countries, and shall give further impetus to their embedded mutual coordination in regional and international forums. Submitting a message to President Al-Bashir form his Chinese counterpart, the senior Chinese official put it clearly that China’s selection of Sudan as strategic partner, was notva random or arbitrary decision, but rather an option carefully calculated and studied. That is why the said visit was highly celebrated in Khartoum, both in form and substance, as the most important visit of a senior Chinese official, perhaps since the visit of the Chinese presidentHu Jintao to Sudan in 2007, which brought the long standing cooperation between the two countries to yet a new level. From historical perspective, it goes down in history, that Sudan was the fourth country in the continent, to have established full diplomatic ties with the People’s Republic of China on 4th February 1959. Since then, China has continued to maintain good and exemplary relations with Khartoum to meritoriously culminate in the year 2015, into strategic partnership, when the Sudanese President Al- Bashir was accorded a red carpet treatment during the latter’s historic and landmark visit to Beijing. The win-win formula was the impetus and the driving force behind Sino-Sudanese rapidly evolving relationship. As a matter of fact, If China’s contribution in the development of Sudan’s oil sector continues to be envisaged as highly significant to Khartoum, nevertheless, such engagement could not have easily streamlined without China’s own receptiveness to the prospect. Likewise, Khartoum with its timely adoption of its Look East strategy at that time was at the right time of history; Sudan in particular was equally important to China’s efforts to develop its oil sector. No surprisingly, Sudan acted as China’s gateway to Africa. In other words, China’s involvement in Sudan spans an important phase in the restructuring and expansion of china’s own national oil companies overseas; China’s aim at that time was to build internationally competitive firms and to enhance China’s security in regard to an energy supply. Arguably, the most important characteristic of the historical relations between Sudan and China is that alongside the economic interactions, it was solidly based on mutual trust and respect. Hence, geographical dimension and the language barriers did not preclude the extension of the relationship on all cultural and social levels. In other words, Sino-Sudanese is a showcase for relationship based on the exchange of mutual interests and benefits and devoid of ulterior or hidden agendas. What further features and signifies the visit of the senior Chinese official to Khartoum is the fact that it comes in the framework of China’s 900 billion dollar’s Silk Road Vision, which was recently kicked off by Chinese President Xi Jinping. It has been globally perceived as absolutely the most ambitious development and infrastructure project, with the aim of building a modern version of the ancient Silk Road. In light of the pressing problems and challenges currently facing humankind almost all over the world, the Chinese “Belt and Road initiative, represents a glimmer of hope that will surly benefit the people all over the world, particularly the third world. The initiative firmly predicated that civilisations by and large, thrive with openness and nations prosper from trade exchange. Sudan has every reason to wholeheartedly support the Chinese initiative; taking into cognizance that Sudan historically, and due to its geographical location, was a link between the Arab world and Africa. Besides, perhaps since time immemorial, the ports in Eastern part of Sudan have been the meeting-point for convoys coming from China to Africa. Sudan has always maintained its desire to encourage more African countries to strengthen mutually beneficial cooperation with China under the framework of the Forum on China-Africa Cooperation. In fact the package of projects planed in the womb of this initiative, represent the main starting point for the advancement of developing economies like the Sudan. Luckily enough, Sudan and China are currently putting the final touches and understandings to embark on a number of vital projects in the fields of transportation, energy and agriculture. To that effect, Mr. Zhang stressed the need to create synergy between the Belt and Road Initiative and Sudan’s development strategy and boost bilateral cooperation in some new areas such as agriculture, mining and port construction. Perhaps the most ambitious developmental project in the initiative is the modernization of the railway network at the regional level; taking advantage of Chinese expertise and funding, China plans to finance and build a railway connecting Ethiopia to Sudan in the footsteps the Ethiopia-Djibouti recently constructed railway line, which besides providing Ethiopia with yet a new sea outlet for the Red Sea, shall further cement consolidate the already evolving Sudanese-Ethiopian bilateral ties in all fields of mutual benefits ..
By the same token, a similar giant project in the pipeline, is the railway line linking Sudan with Chad and Cameroon to the west, which will form the basis for the completion of the African ambitious dream of linking and connecting Africa by trains from South Africa to Egypt in the north, and from the Red Sea in the east to Senegal and the Atlantic Ocean in the west. These promising projects shall heavily boost the Sudanese economy and multiply its innumerable investment opportunities. As a matter of fact and with regard to the energy projects, Sudan has already begun to benefit from the Belt and Road initiative, unleashing serious negotiation for the establishment of the first Sudanese nuclear plant for peaceful purposes in cooperation with Chinese companies. In the same context, Sudan is currently seeking to discuss opportunities for financing solar power stations as well as constructing more dams for irrigation and electricity projects. As referred to in the beginning of this article, Sudan enjoys a long two – decades of cooperation with China in the exploration, production and export of Sudanese oil. During his recent visit, the Chinese senior official, Mr. Zhang reiterated that the two countries need to strengthen cooperation in oil and gas exploration and development, and work actively to explore new cooperation areas under the framework of the Belt and Road Initiative. In agriculture, taking stock of Sudan’s huge natural resources, Sudan will be one of the largest beneficiaries from the Chinese initiative. Perhaps the giant strategic projects shall include inter-alia, the implementation of a big and exemplary slaughterhouse for the export of Sudanese meat, such promising and long awaited project, shall warrant the influx of additional hundreds of millions of dollars to the Sudanese treasury, in the form of added value of livestock and carcass waste. Moreover making use of Chinese extended expertise and technology, the two old friends are currently engaged and planning to join hand in hand, to boost Sudan’s huge potential in cotton production, with the ultimate goal of making the Sudan great again in the field of textile industry, both regionally and internationally. On the political level, the belt and road initiative is projected to play effective role in the establishment of further pillars of stability and peace in the Sudan; via its huge development projects, the initiative shall directly address the remnant root causes of poverty and conflicts in a country like the h the Sudan. The initiative is anticipated to play a major role in promoting and consolidating the chances of peace and stability, taking into consideration that, the initiative-per se- can and can only succeed and flourish in a framework of love, coexistence and peace. Mr. Zhang reaffirmed in Khartoum that China will, as always, support Sudan’s efforts in safeguarding its sovereignty and territorial integrity as well as achieving domestic peace and stability. 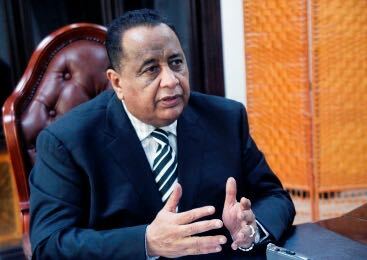 Joseph Hammond recently spoke with Sudanese Foreign Minister Ibrahim Ghandour in Khartoum. In July, Trump decided to continue the probationary period on Sudanese sanctions another three months until September. Question: What are Sudan’s foreign policy priorities at present? A: Our priorities are first of all good relations with neighbors we always try to strike “zero problems with neighbors” and we are surrounded by six neighbors and each of those countries have either internal conflict or international problems at the moment. Taking a wider few to the East we have we Al-Shabab and Boko Haram to the West. We also have the problem of ISIS in our region. Solving these security challenges involves close coordination with our neighbors and that is our priority. Sudan is both part of Africa and the Arab region so that is a priority before we look wider afield for allies in solving those issues. In nutshell our goal is to have our country at the heart of peaceful and integrated region. Q: In 1995, the United States imposed sanctions on Sudan due to its support for terrorists like Bin Ladin and Carlos the Jackal. The former is now dead and the latter is now in prison after he was surrendered by Sudan to France. What is Sudan doing to ensure the Trump Administration lifts the sanctions? A: In June 2016, we received and agreed up a five track plan between the United States of America and the Sudan. The five tracks include counter-terrorism, an investigation into claims that we have a link to the Lord’s Resistance Army(LRA), Peace with South Sudan, Peace within Sudan and as well as humanitarian issues. We engaged on this for 6 months with the Obama administration to relieve the sanctions and that happened in January this year. We have had several meetings on this process at the hieghest levels including with Dr. [Susan] Rice and we engaged with [Secretary of State] John Kerry. We had a lot of engagement and we are waiting for the final decision in July. In the last week of April, we had more meetings with the U.S. government and both sides agree there has been 100% implementation from of the five track plan. Sudan has been contributing to U.S. counter-terrorism efforts since before the turn of the century and the Pentagon confirmed that there is no links between our government and Joseph Kony’s LRA. On the basis of the last bilateral engagements things are moving forward. Q: The fate of the sanctions aside Sudan is still-listed as a state sponsor of terrorism. A: There will not be economic issues after July if things go smoothly. However, if the state-sponsorship designation continues it’s a diplomat paradox. Last year on 15th of June the outgoing CIA director [John Brennan] said Sudan is cooperating very well with U.S. counter-terrorism efforts. How can a country be cooperating on U.S. counter terrorism efforts yet remain on the state sponsor of terrorism list. The administration should work with Sudan to have its named removed from the state-sponsorship of terrorism list. Q: Well to clarify Sudan is not under embargo its under sanctions. A: I mean practically speaking it has been embargo on us because other countries are not trading with us with us due to U.S. sanctions. So Sudan shifted to Iran and other countries to help the national army to support a rebellion. A rebellion I might added aided by the same countries who were imposing this embargo. Everybody knows the South Sudan has been supported by the West and other regional countries. Iran is not our natural ally but, it was necessity. When you are pushed against a wall you find you can do anything. Q: Earlier this year Sudanese President Omer Al-Baashir visited Ethiopia and called for the creation of a Horn of Africa economic community. His proposal was supported by his Ethiopian hosts but, what is the status this union? A: Yes, the Horn of Africa economic community was discussed between Baashir and the Prime Minsiter of Ethiopia [Hailemariam Desalegn] and both leaders agreed it is an important issue that should be discussed. Additionally, Somalia and Djibouti have responded positively to the proposal. A meeting of experts has been scheduled for late June and then there will be a foregin ministers meeting. If things go forward there will be a summit and a declaration. We are hoping that this issue will come to a reality there is a lot in common between the countries in the Horn of Africa. There is a lot of potential for stronger economic partnerships between these countries and Sudan. Economic collaboration means collaboration on everything. This organization can work to ensure that we are better connected by road, rail and there is free movement of people and goods. A: Let me separate this issue as these are two questions are relations. With the Russia we maintain excellent Russian relations. Russia has invested in our economy in particularly in gold mining. In fact we have good relations in all other fields. Russia supports Sudan and on the Security Council when we face unjustified pressure. Q: There is a major conflict on your borders in Libya. What role is Sudan playing in Libya? A: We are very concerned about the situation in Libya…This is a conflict with clear consequences for the world beyond our region as well. For example, the fighting Libya has made it difficult to combat illegal migration from our region through Libya or Algeria and onto Europe. One of concerns is of course the conflict in Libya will impact the on-going peace process in Darfur. In Darfur other than one or two holdouts there is now peace throughout the region. However, we are concerned that there are 600 rebels from the Minnawi faction of the Sudan Liberation Movement who are fighting in Libya with General Haftar’s forces. Those rebels could return any time with supported from Libya and re-ignite the war in Darfur. Thus we have deployed 2,000 troops along are border with Libya. We are also concerned about ISIS, they have been kicked out of Sirte but, they are now regrouping who knows where. We are also concerned about the fact that Southern Libya has become a no-man’s land. The civil war in Libya must be solved by negotiation with the various factions. On January 13, 2017, one week before the end of his term, President Obama issued a long overdue decision: the Sudan Executive Order. It is a partial lifting of US sanctions against Sudan allowing trade and commerce with this previously ostracized African nation. This creates a potential to provide vital economic relief to the people of Sudan, who have been the victims of this unjust trade embargo and financial stranglehold imposed by the Western financial system for almost twenty years. There are some sanctions that remain in effect, with U.S. State Department unfairly maintaining Sudan on the list of “states sponsoring terrorism.” While the executive order is only for six months and will have to be reviewed by President Trump on July 12; the incoming Presidents team was briefed prior to the issuance of this executive order. There are reports that President Trump, may permanently remove the sanctions altogether, but this remains to be seen. Under the Sudan Executive Order, businesses interested in investing in Sudan will be able obtain licenses. Also, U.S. and foreign banks will be allowed to conduct financial transactions with Sudan and its people without fear of being penalized. This belated decision to finally ease sanctions after almost two decades was not done out of altruistic concern or compassion for the Sudanese people. Rather, it emanated from geo-political calculations–the same flawed political thinking of Western intuitions responsible for the terrible economic conditions in Sudan and South Sudan today! For over twenty five years, an anti-Khartoum cabal met in Washington DC conspiring to divide Sudan. Their cynical effort did result in the 2011 break-up the largest nation in Africa, but not for the benefit of the poor Sudanese people living in the south. Their intent was to create another flank for regime change. It failed miserably, as anyone with knowledge of the countries could have foreseen. The same Western institutions that have brought South Sudan to what some have already label a “failed State” now want to take away its sovereignty, which South Sudan rightfully rejects. The danger of allowing South Sudan to spiral out of control is beyond what some imagined when they began this gambit. The following factors should be considered. First, the decades long policy to topple the government of President Omar al-Bashir, and weaken the central governing authority of Khartoum failed. However the effects the policy did succeed in imposing harsh living conditions on the Sudanese people. Second, the West desperately needs Sudan in the Horn of Africa. The US and Great Britain supported the campaign to separate South Sudan from Sudan. It is not possible to stabilize South Sudan without the active involvement of the leadership in Khartoum. Anyone who says otherwise is simply wrong and does not understand how Sudanese society functions. Third, the recent shift of alliance by Sudan away from Iran and towards Saudi Arabia is considered favorable to the US and UK special relationship with Saudi Arabia. Fourth, the sharing of information between Sudan and US intelligence agencies in the war against ISIS has led to a new level of collaboration. What needs to be done (and should have been done over a half century ago when Sudan achieved independence from its British colonial master) is to immediately assist Sudan and now South Sudan to develop its large unrealized agricultural potential. It has been known for many decades that Sudan contains one of the largest uncultivated rich arable lands in the world, which is now divided between the two nations. Before its forced separation, studies were conducted that estimated Sudan potentially could produce enough food to feed the entire continent of Africa-approximately one billion people. Northern Sudan is another rich area for agriculture production that is sitting on top of a gigantic underground lake-the Nubian Sandstone Aquifer. In addition to oil, Sudan is rich in other valuable mineral resources that have never been developed. Uniquely Sudan is also a melting pot of cultures from North Africa, the Middle East and sub-Saharan Africa, which anyone can see visiting its Capitol Khartoum. Port Sudan is already part of China’s Maritime Silk Road. The entire continent is now being developed for the first time, with major infrastructure projects in energy, rail, road, and water as China’s Silk Road has expanded into the continent over the last decade. Once freed from sanctions and isolation, Sudan can contribute to the development of the Horn of Africa, utilizing its location at the crossroads of the future East-West railroad. The potential for expanded rail connection in the Horn and across the continent already exist with the construction of the Kenya’s Standard Gauge Railway and the Addis Ababa-Djibouti electrified railroad; both built with technical and financial assistance from China. Ethiopia’s completion of the Grand Ethiopian Renaissance Dam in 2018 will help power the region with 6,000 megawatts of electricity, literally energizing East Africa’s rate of development. Since the nineteenth century Sudan has been coveted for its strategic position in Africa as an abundant land mass that encompasses the Nile River, bordering seven nations, and the Red Sea. A stable, peaceful and prosperous Sudan benefits not only Africa, but all nations on the planet. Let us not delay one moment longer the realization of this eminently feasible vision. Improving the standard of living of a poor people is a superior foreign policy to overthrowing governments and imposing sanctions. On Monday October 10, Sudan celebrated the conclusion of the historic National Dialogue intended to give birth to a New Sudan and new constitution. Joining Sudan’s President Omar al Bashir on the dais were the heads of state from Egypt, Uganda, Chad and Mauritania, all who spoke in support of the agreement along with representatives from Russia, China, Ethiopia, and the Islamic Cooperation Organization. To help unify the nation, which has suffered from years of civil conflict, all parties should coalesce around a program for investment in the most vital categories of infrastructure; electrical power, railroads, water management, roads and finally cultivate Sudan’s huge amount of fertile land that has never been fully exploited. Such an infrastructure led developmental approach will not only increase the productivity of the economy for the benefit of all citizens, but will provide meaningful productive employment that will give the youth hope for the future. Sudanese who can prove a lineage to the tribes of Southern Sudan will vote on Jan. 9, 2011, on whether to secede from Sudan to form a new state, or remain as part of one united country. If the referendum takes place, and if Southerners vote for separation, as many predict, the underlying issues between the North and the South will remain unresolved. In fact, the referendum, if it comes off, may put Sudan and the region back on the path to war. The splitting up of Sudan, the largest country in Africa, which dominates the Horn of Africa and the Nile River system, is wrong: wrong for the people of Sudan, wrong for Africa, wrong for the world. It should not happen. But the British imperialists and their hangers-on demand it. It also has the potential to lead to an expanded, regionalized war, more deadly than anything we have seen thus far, as a result of Sudan’s neighbors becoming militarily engaged. EIR: It is now approaching the second month since the separation of Sudan into Sudan and South Sudan, and I would like to get your evaluation of how things are proceeding, and what the future looks like for the two Sudans. On the eve of the acceptance by the government of Sudan in Khartoum of the Southern Sudan referendum for separation, forces committed to the British imperialist policy of fragmentation of the nation of Sudan have once again chosen Darfur as the battleground to foment a new confrontation between Khartoum and the West. This new anti-Sudan effort is being led by Susan Rice, President Obama’s ambassador to the United Nations. Having just returned from Sudan, where I spent two days in Darfur visiting the headquarters of the United Nations-African Union Mission (UNAMID),surveying three Internally Displaced Person (IDP) camps, and meeting with local officials, I can say it is abundantly clear, and acknowledged by many, that Susan Rice is the biggest obstacle to peace in the region.